Setting up a media center is a rewarding activity, specially after you're done tinkering with all the options and apps and can finally sit back and relax on your couch. You could have on your media center room other devices such as videogame consoles, music players, and others, to add to the functionality and options your entertainment center as a whole can offer to you. There is a drawback to this, though, and it is that if you have lots of devices, usually you will have lots of remote control devices as well, cluttering your coffee table and making you waste precious seconds every day, getting the right remote. But what can you do to avoid this? The Logitech Harmony Smart remote allows you to control up to 8 devices. One possible solution would be integrating all your options in one device, such as the NVIDIA SHIELD Pro, however this isn't really the best option if you already have the devices and just wanna simplify things. Perhaps you need a remote that can control most of your devices in an easy and straightforward way. 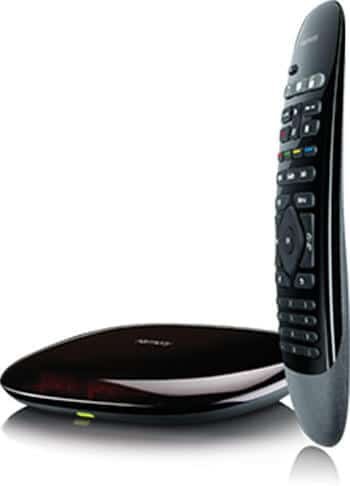 In this Logitech Harmony Smart review you will see that this remote is quite a good option to achieve that. In case you only need a HTPC remote control, take a look at some wireless HTPC keyboards or, if you want to control your TV box with your phone, check out apps like Yatse, the XBMC/Kodi remote or Kore, the official Remote app for Kodi. Logitech Harmony Smart review: how does it work? An annoying characteristic of IR remotes is the fact you have to point them at the device for them to work. This is solved if you have a remote that works via Bluetooth or RF, but most media devices such as TVs work with IR technology. After our Logitech Harmony Smart review, we were able to understand how the Logitech Harmony Smart Control tackles this issue; the remote communicates with a hub via RF, and this hub relays the control signal to your devices, via its two IR blaster ports, where you can connect the auxiliary IR blaster (included). The hub also emits IR signals, so you would technically be able to control everything inside a cabinet -because the IR signal would bounce inside it and hit your devices-, and with the blaster you could control your TV. The hub also controls things like videogame consoles via Bluetooth, and everything can be done with the RF controller in your hand, without even needing direct line of vision between your remote and the hub. The Logitech Harmony Smart hub receives RF instructions and emits IR signals for your devices. 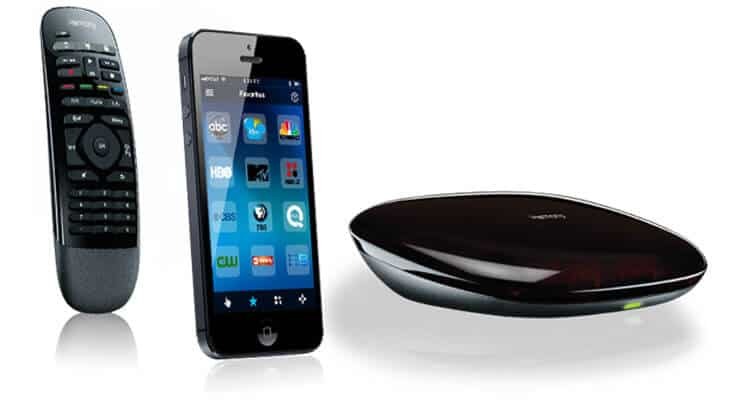 Logitech Harmony Smart review: use gestures on your smartphone to control your media. The good features on our Logitech Harmony Smart review don't end there; you see, if you are tired of using the included Logitech Harmony Smart and Kodi together, because you started to dislike buttons for whatever reason, you can have your smartphone communicate with the hub instead of the physical remote. 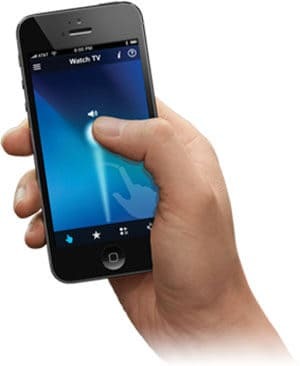 All you'd have to do would be downloading the Logitech Harmony Remote software app for iOS or Android, and this would enable you to control your media devices with gestures, among other cool things. The setup is done online and, though time consuming, it makes things easy in the long run. This is one of those devices you can set-and-forget, making it easy for everyone in the house to use it, regardless of their technological skill. From this Logitech Harmony Smart review, it is evident this remote can be considered the best remote for HTPC that also allows us to control other devices. Logitech Harmony Smart review: would you recommend it? The Logitech Harmony Smart and Kodi are a good match thanks to the center buttons on the remote. After our Logitech Harmony Smart review, I would say it is a good piece of hardware if you have the need for it. Personally, I would just go with buying one device that can do everything, instead of having lots of devices for different tasks, and perhaps get a useful keyboard such as the Logitech K830 Wireless Backlit keyboard; however, this might be impractical if you already own a lot of devices or if you have the need for special hardware such as videogame consoles or music players and want to control everything from one single remote. This also does not help you get rid of every remote; in the case of videogame consoles for example, you would still need a videogame controller -I don't really see myself playing a modern shooting game with a TV remote, anyways- but overall this is a very good option to expand your HTPC and add comfort and usability for everyone around the house.